Aside from the discussion of temp guns, I found your inset photos to be very enlightening, Roger. It is obvious even to an untrained eye like mine that tire pressure has a visible and dramatic effect on tire temperatures. The noticeable rise in temperature (even if it is only surface temps) between 41 psi and 11 psi is alarming. That is the moral of the story anyway, isn't it? Don't ride on underinflated tires! Thanks for a fascinating post. I use an IF gun to take tire and wheel hub measurements. 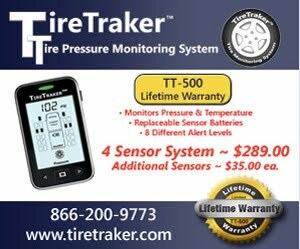 However, I also use a TPMS to monitor my tire pressures. The IF gun is mainly to track wheel hub temps. When shooting tires with an IF gun, people should not be concerned about absolute numbers but rather major differences between tires and hubs on the same side. Sun side versus shade side will make a big difference. When using my IF gun, I am looking for something that is alarmingly different, higher in temperature than all of the others. Roger, it is obvious to me you have made rocket science out of a simple semi-quantitative indicator of operating tire condition. What ever the reason, an IR indicated high temperature (maybe <140F or so) would dictate the need for some further investigation. This is not a race tire. It is a large tire on a motorhome operating at 60 mph or so, for example, where a slightly higher temperature may only indicate the sunny side of the coach. BUT it would certainly indicate: Hey, at least look at the tire, does is seem low? Check the air pressure, which will be higher than cold, we hope. See, if not do something. We are not concerned about your racing tire measurements of plus or minus 1 or 2 or 5 degrees. Get real. The IR temperature measurement is a good quick check at the rest area to say. hey, everthing looks normal! I tend to go into too much detail. The point I was trying to make was that IR guns are not the proper tool to use to establish or set your inflation. They have their uses but using their temperature reading as a guide for establishing cold inflation is not one of them. I think they are a valuable tool to compare one tire to another, or one wheel bearing to another. If only to have a bit of confidence things are normal. I would use a air gauge to measure tire pressure.